“Never say never”, states GM North America President Mark Reuss. The General is already looking into a plan to re-enter the medium-duty fray just nine months after discontinuing the Chevy Kodiak/GMC Topkick truck line, a move that left a few puzzled and a void to be filled. This time around, however, the game plan may offer ‘roided out Silverado and Sierra models (as if the latest offering wasn’t enough) to better compete in the class 4/5 truck segments in which the currently dormant Topkick and Kodiak models struggled. Failing to make a sale of its class 5-7 truck line to either Isuzu or Navistar is what influenced GM to call it quits in the first place. On the other hand, dropping out of the medium-duty truck segment allowed General Motors to streamline their resources in the “core businesses.” Needless to say, this left the commercial line crippled. The General currently has no answer to models such as the Ford F-450 Super Duty or even the TerraStar Class 4/5 work truck, let alone larger models such as Frieghtliner’s Business Class M2 112. What’s more, there has been a significant demand from GM’s commercial fleet dealers for a 4500 Silverado/Sierra type model since the discontinuation of of the Kodiak and Topkick line. Sources further tell us that the chances of the possible 4500 pickup trucks surfacing in the future are “very good”. Needless to say, this writer is very excited about the possibility of 4500 HD models or even a potential 5500. The Kodiak just couldn’t fill the position that these potential models are able to offer and a double offering of newer, bigger Kodiak/Topkick models and supersized Silverado/Sierra pickups sounds just like the perfect recipe for a successful commercial fleet. 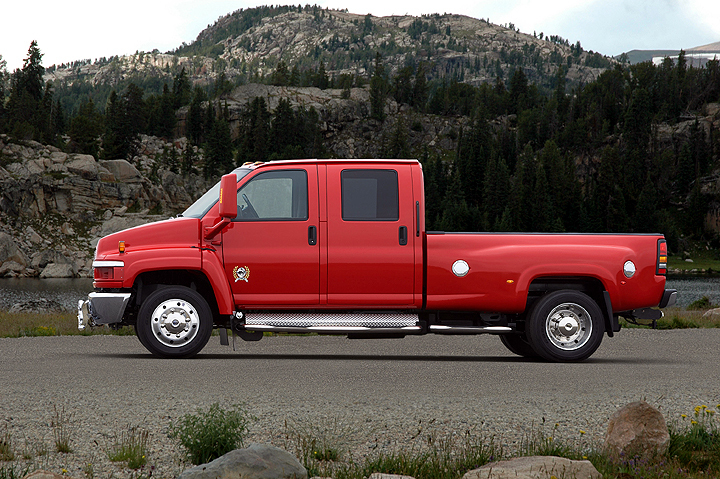 When is GM planning on coming out with the 4500 & 5500 model pickups? I would like to see just the gmc brand made topkick 4500hd pickup and 5500hd pickup an bigger. Chevy shood keep building cars and smaller trucks up to 3500hd.